Welcome to the Funcave » Got R2 Haiku? Last Day To Vote! Got R2 Haiku? Last Day To Vote! 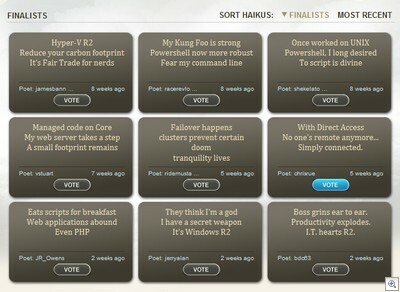 The voting in Microsoft’s kickass R2 Haiku contest ends today. 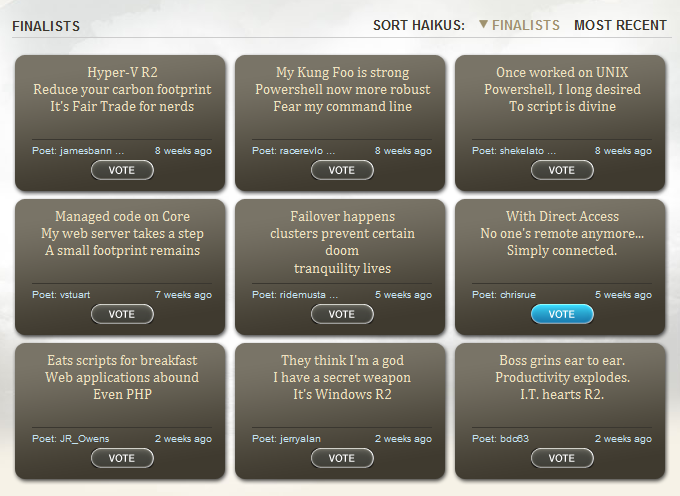 My entry about DirectAccess ended up being one of the nine finalists, which means I’m still in the running. So if you don’t mind, take a second to hop over to the voting page and toss a vote my way. To vote, just click the VOTE button under my entry (shown above). Login to Twitter when prompted, and then check that it recorded your vote by turning the VOTE button blue. Easy peasy.